This Greek Fava and Pumpkin Soup is made from scratch and is healthy, filling and perfect as a starter for a dinner party or a light supper. Leftovers can easily be made into a delicious dip. Don’t confuse Greek fava with fava beans (Vicia Faba) although “vicia” and “vetches” are classified in the same genus. Greek fava (lathyrus clymenum), looks like yellow split peas, but is much tastier and is produced in various parts of Greece. The most popular one is the one produced on Santorini Island, because of the volcanic soil and the climate of the island, which doesn’t need much water to grow. Fava, has been documented and attested after excavations by archaeologists in Santorini. The eruption of the volcano of Santorini, during the Minoan Bronze age, around the 16th century b.C, revealed remains of stored seeds, identified as Lathyrus clymenum seeds, burried under its white ashes (not lava) called aspa in Greek. Pulses and dried legumes, have been cultivated in Greece for millenia and are staples of the traditional Greek Diet. Reading an article at Naturopathy in Greece, here are a few of the properties about Legumes or pulses. “The very low glycemic index of legumes, abundant in slowly digested starches, helps keep the blood glucose at low levels, and equally, the ensuing pancreatic insulin response. Legumes are low in fat and high in protein. They are also good sources of flavonoids, contain both soluble and insoluble fiber, and are full of cardio-protective nutrients such as arginine, Vitamin E, the B vitamins including folic acid, and minerals such as calcium and zinc. The most common dish made with fava in Greece, is a kind of pudding served as an appetizer, with the same name: Fava is boiled with a finely chopped onion until the water evaporates and it becomes soft and falls apart. When it is ready, olive oil, salt and pepper is added and continues to be cooked for five more minutes. It is served with extra virgin olive oil, lemon juice and finely chopped onion and parsley on top. Fava pantremeni (which means married), is similar to the Cypriot lentil dish Moudjentra with the addition of fried onions. A similar dish is also made in Cyprus with louvana (Lathyrus Ochrus) also known as Cyprus vetch. However, in the Greek dish, fava is “married / combined” with the fried onions and two more products which Santorini is famous for, which are capers and tomatoes are added to the onions and sauteed together. Half of this mixture is mixed in the boiled fava and the remaining is served on top of the dish. Instead of posting this dish, below you can find two new recipes of mine with twists on this classic recipe. The first dish is a pumpkin soup. Although the weather is much better now, yet we don’t mind still eating some soups especially because of my husband’s gallbladder diet. 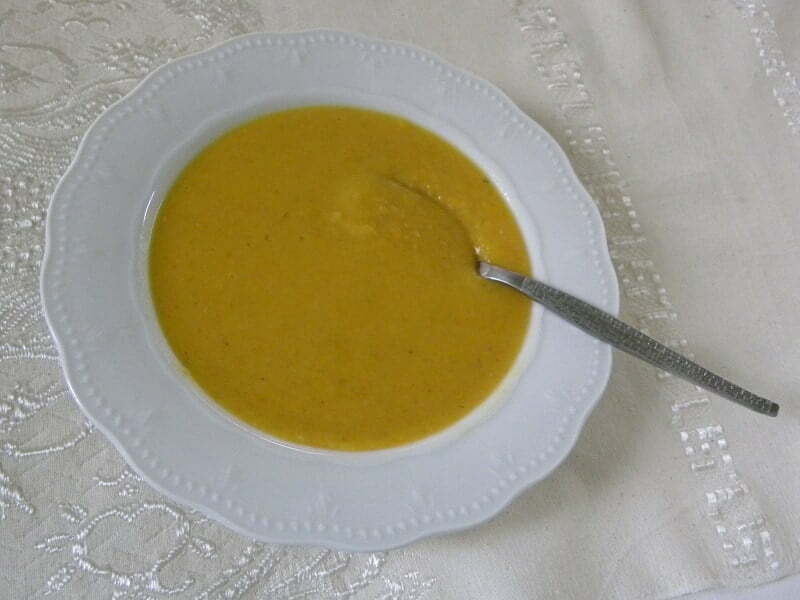 This recipe was first made during December but since soups are good for the gallbladder and since I had some roasted pumpkin in the deep freezer, I made it again a few days ago. The only thing I changed was to add less olive oil (about 1/8th cup) and of course no chicken stock. During the winter, we also added some pasto (smoked pork) in the soup and it was delicious. It goes without saying that this was not added the second time, but I can assure you that still it was a very delicious soup. This soup is vegan as it is not necessary to add the chicken stock or the smoked pork. If you cannot find Greek fava, you can make this soup and the dip with other grain legumes such as Lathyrus sativus or the yellow split peas (Pissum Sativum). In Cyprus you can make it with louvana. Note: In Cyprus, the fresh leaves of the vetch are made into a salad, which is called louvanosalata. Soak the pulses from the previous evening or early morning, for at least 5 to 6 hours, as per instructions on the packet. Put them in a colander and rinse well. Put them in a pot with water to cover them and bring to a boil. Lower heat and skim well. Drain again. In a large saucepan, heat the olive oil and sauté the onion and garlic with a little salt and pepper until translucent. Put the pulses in the pot, stirring well to cover everywhere with oil. Add the potatoes, carrots and celery, bay leaves and chicken broth (or water with cube). Bring to a boil over high heat, lower heat and simmer for about 1 – 1 ½ hours until the pulses are soft. More water may be needed. Meanwhile roast the pumpkin and purée it using an immersion blender or a food processor (or if it has been frozen, thaw it). Purée the soup as well and add the pumpkin and mix. Boil together for 5 to 6 minutes, turn off the heat and add a little raw olive oil and stir. Note: If you are not on a gallbadder diet you can also add a few pieces of pasto (smoked portk) and serve the soup with freshly ground pepper on top. This Greek Pumpkin and Fava Soup is made from scratch and is healthy, filling and perfect as a starter for a dinner party or a light supper. Bring to a boil over high heat, lower heat and simmer for about 1 - 1 ½ hours until the pulses are soft. More water may be needed. I had some leftover soup, so the next day I drained all the liquid and used it as a base to make a Fava and Pumpkin dip. I always work with ingredients I have at home and feta is always in my fridge and since I had roasted red peppers, I decided to combine them based on my Scarlet Pesto with Piperies Florinis recipe. Put the garlic with lemon juice and olive oil in a food processor and mix. Add fava, red peppers as well as the remaining ingredients and purée. Serve with extra olive oil and a pinch of paprika on top. I take this opportunity to thank all of you for your kind wishes on Facebook for my birthday today. I also want to wish you all a Happy Easter and inform you that my blog will be on hiatus for a short time but I will catch up with your news either on Facebook or Twitter. If you liked my recipe pin it on Pinterest to make it later on or when you make it, I would be glad to see your photos on Facebook, Twitter or Instagram, using the hashtag #Greekpumpkinsoup or #Greeksoups. Great recipes! Favas are so versatile and delicious. Both the soup and dip look really good. Soup looks so healthy and yumm. Wishing you again a wonderful day Ivy. Legumes are just amazing ingredients! The fava soup with pumpkin looks particularly delicious. Happy Birthday my friend! Fava soup and Fava Dip? Where is the birthday Cake? I think I have to prepare one for you today!! HAPPY BIRTHDAY IVY!!! Merci mon amie, grâce à toi, nous découvrons de magnifiques recettes. I just love what you’ve done with the fava! I could dive into both! I adore fava! I love how you made the dip with the paprika, Ivy. I have to try this for sure! I love that Greek fava bean soup..so tasty and flavourful. Fava pantremeni looks really interesting…I first thought it was cooked with eggs. This looks familiar. We use this Lentil in India. It’s called the Toor Dal (Dal means Lentil). These recipies are awesome. I’ll surely love to try them with the Toor Dal I have. Very interesting post, Ivy. And both the soup and the dip look very nice. I wonder if I can fing Greek fava here. Thank you for introducing me to greek favas, the dip would be a hit in my home!! Delish!